From time to time, Steven’s publisher offers a limited-time offer on the ebook version of his bestselling cookbooks. This month, you have a chance to purchase TWO of Steven’s recent ebooks for less than $3 each. 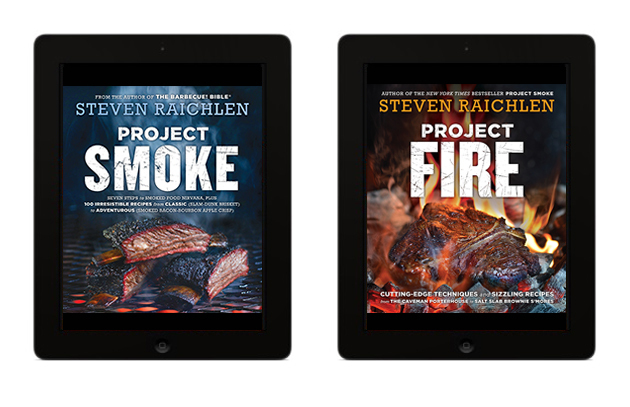 We’re happy to announce that from 8/21 – 8/27 you can purchase Project Smoke on sale wherever ebooks are sold. And from 8/20 – 9/4, the newest cookbook Project Fire will be available at the same amazing discount. Where There’s Smoke, There’s Fire. With over 200 innovative smoking and grilling recipes between the two books, how can you pass up this great value? And newly launched this week, Walmart and Kobo have a dedicated ebook website featuring Project Fire. Check it out here. Using your device at the grill? Share with us on Facebook, Twitter, Instagram, and on the Barbecue Bible board on Reddit.